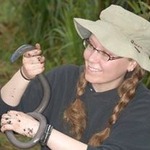 I am an Assistant Professor of Biology at Ohio Northern University, conducting research that integrates field and molecular methodologies and introduces students to the multifaceted field of conservation science. Through my research efforts I hope to improve our understanding of the role anthropogenic environmental change plays in depressing wildlife's ability to resist pathogen infections. This spring, with support from the Fulbright Early-Career Fellowship, I will be assessing whether the presence of introduced, non-native trout alter skin-associated microbial communities of the native glassfrog species in the Mindo region of Ecuador. Working with local community members and farmers, we hope to improve our understanding of potential problems associated with the trout farming practice while assessing ways to minimize negative effects and protect the this fragile cloud forest ecosystem. The things we do for science! Hope you have a good audiobook to listen to!